I am pleased to be given the opportunity to speak to Mayor and Council on the things that General Aviation does for a community. Despite what a great many people think, the average cost of a plane on our airport is similar to the cost of an average car or boat. We are not a bunch of rich guys. Those of us who have chosen to fly as a hobby do have the privilege of landing at an airport, renting a car, staying in a hotel, and purchasing local goods and services from the area. That is good for business and the economy in the local area. We are all very lucky to have an airport in our Nanaimo region. Our airport is a dual use public facility as it not only provides an important air link in our transportation system, it also provides a facility where general aviation may keep their planes, as we can’t keep them at our homes. There is really no added cost to the operation of an airport to have general aviation present. The grass still has to be cut, and the runways plowed in the winter to serve commercial scheduled carriers. General aviation provides many benefits to an airport, one in particular being that can report any inconsistencies at the airport which is a huge safety factor. A regional airport should be on a piece of land that will provide room for expansion as the population in our region grows and if the general passenger traffic increases. The CYCD has that. Those of us who fly and have learned something about weather realize that our CYCD does have a problem. In the cooler months, the warm air from the Nanaimo Harbour and Ladysmith Harbour meet with the cooler air moving out from the Nanaimo River watershed, and we get fog. Yes, the Nanaimo airport was built in the wrong place and we have to deal with that. A number of general aviation people at CYCD wanted to keep their airplanes out of the elements. They requested and were assigned small parcels of land on the airport by past Nanaimo Airport Commissions which they leased on a term of five years from March of 1994 with five renewal options, taking them to April of 2021 or 2022. On this leased land, and good faith, we have at our own expense constructed hangers in which to store our planes. We pay an annual rental fee for use of the ground on which our hangers sit to the NAC, and we also pay property taxes on that property. The annual fee we pay to the NAC for keeping our planes at the airport is about $2,000.00 per plane, and we have about 150 planes at the airport. 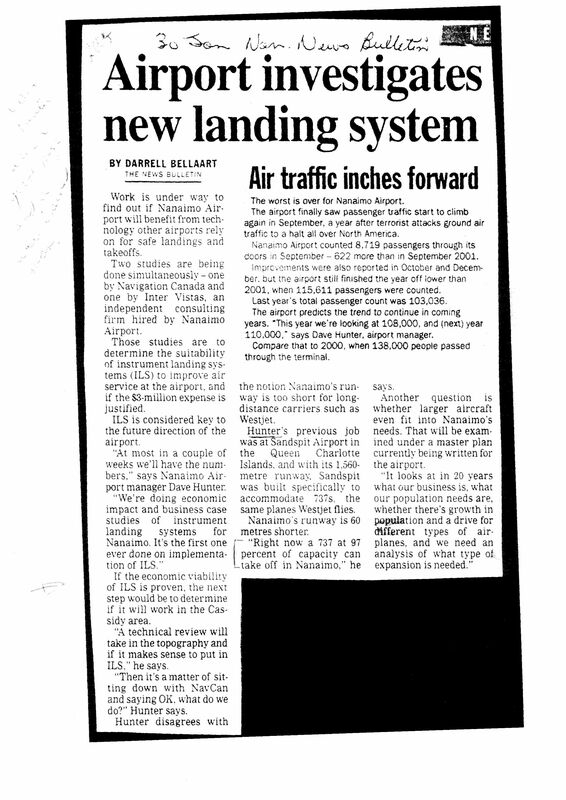 The City of Nanaimo along with Transport Canada installed one of the first 3 microwave landing systems in Canada, and this was done to allow 737 size airplanes to come into CYCD in bad weather conditions. The 737s didn’t come! Dave Hunter who had previous airport experience and was the Airport Manager in Sand Spit, where he worked with TC to install a runway built to handle 737 size airplanes stated that the runway at CYCD was adequate to handle 737 size aircraft. (see article attached, #2). Curtis Grad, another CYCD airport Manager with training in Airport Management, was hired, but was soon lured away from CYCD after only three years, by the Abbotsford Airport. Curtis assisted Abbotsford with its growth, and then he moved to Jamaica, Cyprus and now Jordan. Curtis Grad is a very experienced airport manager, and he stated that the runway and terminal at CYCD could handle 737 traffic. Curtis Grad was instrumental in bringing several new tenants to CYCD, and he is sadly missed. Still we have no 737 traffic, and it is not because of our terminal or the length of our runway, it is the lack of passengers to fill the seats. We now have a new Administration at CYCD, and a manager of the airport who has absolutely no airport experience. His past experience was in the office with McMillan Bloedel. Since he has become manager, he has changed his title from Manager to President and COE, and has convinced the NAC to adopt the “build it and they will come” approach to our airport”. The large air carriers would come if we had the passengers to put in the seats of their aircraft. There has never been so much unrest with general aviation at out airport since the new administration has taken over, and it is an expensive lesson for CYCD. In the future, we must hire experienced people to run our airport. At one of our first meetings with Mr. Hooper we asked him directly, just what management experience he had that would help him know how to run an airport, and he did tell us that he was a manager of MacMillan Bloedel’s operations at Cameron Division and at Powell River. While that may be good management experience, running a forestry company is much different from running an airport. 1.The NAC has appointed a company called DTZ Barnicke to handle airport leasing with its tenants, and a number of the tenants have received renewal leases with reduced terms, from the original leases that were arranged between Transport Canada, the Nanaimo Airport Commission and the Tenant, and with no options to renew at the end of the lease. They have told us that the end of our leases, our buildings which we built at our expense belong to the airport. These are dictator actions, and not acceptable is in a free country like Canada. 2.Barnicke has told us that when our leases end, we may, if the NAC chooses to grant us a new lease, move us to another area on the airport lands. When we ask them who will pay to have us moved, they say that the NAC hasn’t decided if they will participate at all in the cost of any move. This is not acceptable. 3.The NAC has plans to develop CYCD into an industrial park, and the public has not been made aware of this. This hidden agenda is no way to run a public transportation facility. We feel that airport lands should be retained as airport lands. The NAC is using our tax dollars to expand the terminal, and will build a new sewer and water system that will provide facilities for their industrial park. Previous CYCD managers like Dennis Geddes, Dave Hunter, and Curtis Grad are on record as saying that the existing Terminal at CYCD is capable of handling 737 traffic and up to 500,000 passengers per year. Anyone with any business sense would recognize the fact that it will be years until the industrial lands abandoned by the forest industry will ever be used again, so what is the point of developing more commercial or industrial land. They also should be aware that there is a huge surplus of industrial land available within the boundaries of Nanaimo, Ladysmith, and the RDN at this time. It is not right that the NAC is permitted to use our government land and taxpayers dollars to develop an industrial park which competes with private enterprise. I am sure the City of Nanaimo, the City of Ladysmith, and the Regional District of Nanaimo were not aware of this hidden agenda of an industrial park. 4.The unfortunate fiasco to do with landing fees that the NAC introduced in March, and which were retroactive to January 1/10 at CYCD is indicative of the lack of knowledge and understanding of the current NAC people to airport protocol. Even though the fees were rescinded, CYCD has a black eye, and the landing fee issue will not be forgotten. Many pilots who came to come to Nanaimo to clear Customs and get fuel for their planes as well as rent cars and stay in our hotels are going elsewhere. Can you imagine the audacity of NAC sending someone on March 15th, a chart of landing fees, user fees, and movement fees that began January 1st, two and half months prior to that time. Along with the announcement of fees came an invoice for any airplane activity from January 1 through March 15th. Unbelieveable!! NAC did say that they made a mistake, but that just doesn’t cut it. The responsibility of this mistake and the costs involved in manpower and postage to remedy the situation like this lies with the boss. Mayor Ruttan and Council members, we ask you to have a look at the facts of what has gone on at our airport in the past. We have had good experienced airport managers who knew what they were doing, and used all the resources that were available. What is happened at CYCD, is that a few well meaning developer “want a bees” are, and perhaps in good faith I am sure, expanding our airport terminal and using our tax dollars when our current and already expanded terminal is less than one third utilized. Past and proven airport managers of CYCD have stated after a lot of consultation with other authorities, and hrough the news media, that our airport will handle 737’s and up to 500,000 passengers per year through the terminal. Mayor Ruttan and Council, please call in your nominee to the NAC and discuss with him why the expansion is taking place. Ask him to present the real passenger numbers year by year over the last 20 years at CYCD, and ask him if there are plans to expand the airport lands into an industrial park which the NAC has not let the public know about. Air Canada Jazz in the past, had 26 flights a day from Nanaimo to Vancouver. It was down to 6 until two weeks ago, and has now just been raised to 7 flights a day because of the increased daylight. Our current air passenger traffic, from what we can find out, is below what was in the 90s and early 2000s. With technology changes in the communication business, and a lack of money available for business travel, we are seeing that sector of air passenger travel diminish. The changes in the demographics of the population in our area indicate that the baby boomers are still moving in. However, the reduction in their retirement savings, and current world economic troubles are reflecting a further reduction in the general air travel in that sector as well. Our lines of communication with the NAC are broken. Gerry Pink told me himself at the annual general meeting of the NAC held at the Coast Bastion Hotel on April 8th that he was not willing to speak to the Tenants, particularly the NFC. We would like you to help us develop a new line of communication with the NAC, and regardless of whether or not a new Terminal is built, we would like you help us achieve the following. 1.Because we have, in good faith, spent hundreds of thousands of dollars constructing our hangers on designated sites on CYCD lands, we would like a 30 year lease with 5 year renewal terms, and the option to renew again for another 30 years when the first lease expires. There is no way we can get financing on our hangers if we do not have a reasonable lease term which the banks will accept. If we are asked by the NAC when our lease terminates, to move to another site on the airport, which must of course have runway access for our planes, the NAC will pay 100% of the move. The Golf Course another NAC tenant on CYCD lands, has a 30 year Lease, why shouldn’t general aviation. 2.Guarantee General Aviation that they will not be forced into paying airport expenses at CYCD that are directly related to commercial air travel. Please assist us in getting a new open dialogue established with the NAC. We do not wish to deal with Barnicke. Thank you for your consideration on this matter. 9) Although it is not tax dollars going into a public facility in competition with private enterprise, it is no less distasteful to witness tax dollars directly funding the expansion of a non-conforming business — and while doing so, rob the public of funds urgently needed to upgrade the E&N rail line (arguably, a much more important portion of the Island’s transportation infrastructure than that of CYCD). Please note that I’ve copied this to a small few of the many others who’ve been witness to, or shown an interest in, the travesty of these events that we may better pool our talents and resources in the pursuit of governmental transparency. And finally, thank you for refuting the liberties Mike Hooper frequently takes with with regards to selling the airport’s importance to the Regional District of Nanaimo.